University of Kansas received a A.
U.S. News & World Report's ranking of 50 out of 117 of National Universities Top Public Rankings was a major contributor to this grade. The University of Kansas boasts first-rate pre-professional schools in architecture and engineering, and is also strong in pharmacy, nursing, journalism, and education. KU's library draws raves, and the are students rate the computer facilities very highly. Describe the type of student who should attend University of Kansas. Why? The University of Kansas is meant for a student who would like to make a name for themselves at a place that encourages research and self-motivation. What is a typical University of Kansas student like? Describe the type of person that should attend University of Kansas. The only thing most KU students have in common is that we're always busy. Other than that, there's a variety of people, differing in height, ethnicity, where they're from, age, etc. What are the top 3 reasons someone should attend University of Kansas? Nationally Accredited. The University of Kansas is nationally accredited. Top Tier Education. The University of Kansas is a to tier educational institution. Campus climate of care! Professors and staff truly care if you succeed! What was a typical University of Kansas student like in high school? Describe the type of person that should attend University of Kansas. The University of Kansas is an oasis of progressive activism and tolerance. University of Kansas is considered the flagship institution of higher learning in the state. In-state students can be admitted to the College of Liberal Arts and Sciences if they achieve a 21/980 on the ACT/SAT. Those who score a spot in the Honors program have access to smaller class sections and closer relationships with teachers. We're glad you're interested in KU. 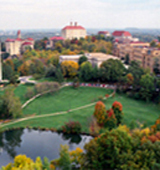 The University of Kansas is a major public research and teaching institution that operates through a diverse, multicampus system. KU's many parts are bound together by a mission to serve as a "center for learning, research, scholarship and creative endeavor" in the state of Kansas, the nation and the world. Let's start from the beginning. A band of contrarians -- opposed to slavery, promoters of freedom for all -- settled a western outpost between the Kaw and Wakarusa rivers in the 1850s. A town was platted and then a great university was begun on Hogback Ridge, high above the river valley and below a boundless, expansive blue sky. The inventor of basketball started a tradition here. The man who discovered vitamins A and D graduated. Helium was extracted from gas for the first time. The first African-American woman to entertain at the White House was a student. Future astronauts were launched into their careers, along with artists, business leaders, presidential candidates, governors, Pulitzer winners and a Nobel Prize winner. National championships have been won. And many pharmacists, teachers, nurses, doctors, musicians, artisans, journalists, architects, engineers and lawyers have begun careers. An ideal campus, historic and wireless at the same time. Close to a metropolis, bordering the prairie. High-tech labs, interactive classrooms, performance venues and athletic arenas. Tranquil mornings, a diverse exciting nightlife. Truly a "castle on a hill." And now for the future. What can you do at KU? The opportunities are boundless. What are the top 3 things that students do for fun at University of Kansas? Go to sports games! Especially KU basketball games. Walk down, eat, and shop on Mass St. Hang out with friends and classmates! 22% of students received Pell Grants, which are provided by the U.S. government to students from middle and lower income families. It gives you an idea of a school’s socio-economic diversity. 62% of freshman live on-campus. 14% of male students live in fraternities. 20% of female students live in sororities. A general program that focuses on the aesthetic, technical, and social development of the built environment and the architectural profession from earliest times to the present. Includes instruction in the principles of architecture and related fields; art history; historiography of architecture; architectural theory and criticism; related aspects of the history of technology and social and economic history; and various period, cultural, and stylistic specializations. A program that prepares individuals for the independent or employed practice of preparing and dispensing drugs and medications in consultation with prescribing physicians and other health care professionals, and for managing pharmacy practices and counseling patients. Includes instruction in mathematics, physics, chemistry, biochemistry, anatomy, physiology, pharmacology, pharmaceutical chemistry, pharmacognosy, pharmacy practice, pharmacy administration, applicable regulations, and professional standards and ethics. 53% of students graduated in the top quarter of their class. The average student pays $16,923 for tuition, fees, and other expenses, after grants and scholarships. Total stated tuition is $9,225, in-state and on-campus, before financial aid. Learn more about financial aid at http://financialaid.ku.edu/. Estimate the net price for you at http://affordability.ku.edu/cs/calculator.shtml. 35% of students graduated on time. The typical (median) early career salary of University of Kansas graduates is $42,100, according to Payscale. University of Kansas participates in the NCAA Division I-A for college athletics. Want more info about University of Kansas? Get free advice from education experts and Noodle community members. I am studying at Kansas State University. Next semester I'm transferring to the University of Kansas. Do you think this is a wise choice? It's really hard to give you feedback on your decision to transfer without knowing more about you and your circumstances.